The Planter's Guide helps you cut through the hype to find the best beer at VCBW. Vancouver Craft Beer Week remains BC’s flagship festival, which draws beer lovers from across the country and around the world. Celebrating its 9th successful year in 2018, it has grown to include week-long events at multiple venues across the city before taking up residence at the Pacific National Exhibition fairgrounds on June 2 and 3. We look forward to the main event at the PNE, where more than 100 top notch craft breweries and cideries will pour upwards of 300 unique products to thirsty aficionados. It’s not only a chance to sample some of North America’s best brews, but it’s an opportunity to nerd out with the brewers and brewery owners themselves. Beer is, of course, one of the world’s most popular beverages, and has been brewed for thousands of years by numerous cultures throughout the world. Typically produced from a proprietary recipe that includes water, barley, malt, yeast and hops, some companies opt to fine their beer with animal-based products that include isinglass (from fish) and gelatin (yuck). Others may include lactose (milk stouts) or honey, which may not appeal to those following a strict vegan diet (even though we LOVE the bees themselves). Here are our picks for the top brews to sample at the PNE this weekend and beyond. Try them first, then make sure to grab a bottle or two when you see them in stores. We’ve been fans of Parallel 49 for years, and we visit their tasting room whenever we get the chance. Their latest seasonal beer is the Trifecta Hopfenweisse, a fruity and delicately savory wheat beer dry-hopped with three flavourful hops: Huell Melon, Meridian and Saphir. Perfect for summer. What’s not to love about Vancouver’s Dogwood Brewing? Launched in 2015 by co-Owner and brew master Claire Wilson, the brewery uses vegan fining agents (seaweed, Irish moss) organic hops and locally-sourced ingredients. Their London Fog, a golden ale with organic Earl Grey tea and French Vanilla, is especially tasty and deserves your attention. Sour beer. Love ‘em or leave ‘em. Personally, I love the tangy, mouthwatering character that the addition of friendly bacteria (lactobacillus) gives to certain brews. Twin City Brewing, nestled in Port Alberni in the heart of Vancouver Island, is introducing their all-new Razzle Dazzle at this year’s VCBW. Along with the aforementioned tang-inducer, fresh peach and raspberry puree is added following fermentation, nicely balancing fruit and flavour. Give it a shot and let us know what you think. Riot Brewing, based in Chemainus on Vancouver Island is equally known for their eye-catching label art as they are for their delicious beer. The brewery is releasing Currant-ly Unavailable, a limited-time-only blonde ale infused with local black currants. Slightly tart, utterly refreshing, we think it will sell out fast. Try it while you can. The team also recently took home silver medals at the Canadian Brewing Awards and gold and bronze awards at the 2018 World Beer Cup. All of Vancouver’s Faculty Brewing Co. beers are vegan, with the exception of their 323 Sourweisse (still delicious, apparently). 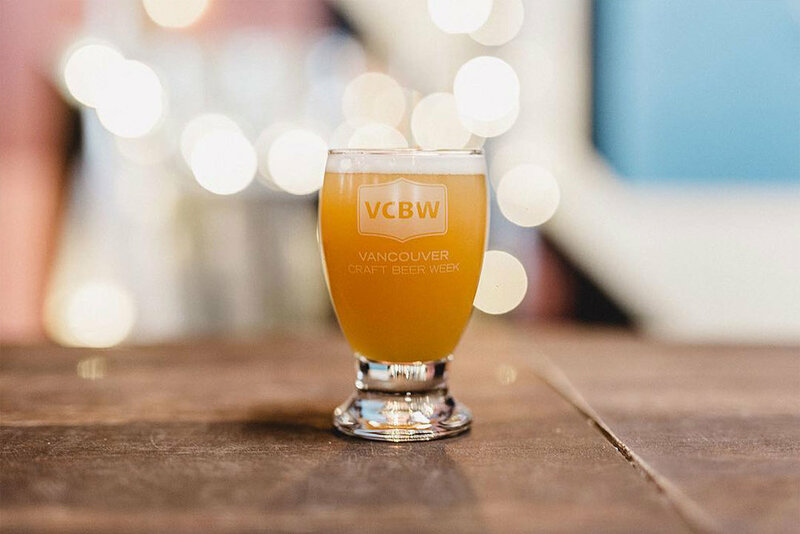 At VCBW, the popular brewery is showcasing the 435 Amarillo Hazy Pale Ale, which is dry-hopped (with Amarillo hops, naturally) and features a heady blend of citrus and tropical flavours. Yes, please. Sometimes it’s the simple pleasures in life. Like a finely-made pilsner, for example. We’ve been fans of New Westminster’s Steel & Oak since they first opened their doors. All of their flagship brews are vegan – including the pilsner, which we think punches WAY above its weight - and will be available to enjoy at VCBW. They also won a silver medal at the 2018 Canadian Brewing Awards, which is pretty rad. Ok fine – if you’re into BC craft beer, you’ve likely already tried this one from Four Winds Brewing in Delta, BC. It’s been a beach staple since we discovered it in six-pack cans last summer. For those that say they don’t like IPAs, this beer could be a game-changer. Clean and crisp, it’s packed with rich flavours of tropical fruit and balanced maltiness. Just delicious. Vancouver Craft Beer Week’s main event takes place at the PNE (2901 East Hastings Street, Vancouver) on Saturday, June 2 (2-7pm) and Sunday, June 3 (12-5pm). Tickets are available now.